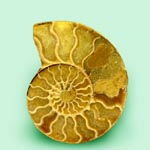 SStone has different intensity of yellow, gold color, from light-yellow gold to darkly-brown. There are буро-red in his palette, green, orange and almost white color. A color depends on the presence of admixtures of iron ferrous, manganese, magnesium, strontium and dispersible organic matter. Raying, has a lamellar picture and radially-radiant structure in wandering forms. Most decorative in differences with the fiery flame-red including of mother of pearl of mother of pearl and golden-черными including of pyrite. Simbircite, Yellow Calcite is an unique carpentry stone, found on territory of the Ulyanovskaya (Simbirsk) region. 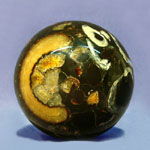 It is a mountain rock, variety of calcite, basis of which is made by goldish marble onyx. 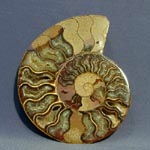 Due to unique geological terms, formation of Simbircite passed in the shells of shellfishes-ammonites. The crystals of marble onyx during 60-80 million years filled the cavities of shells, alternated veined Pyrite, anhydroferrite and fossil mother of pearl, creating an unique picture and colour gamut. Chemical formula of CaCO3. Brilliance - glass, silk, fat. Processed easily, accepts and saves a polish. Fragile, requires the special treatment. Alike after treatment and polish on amber. From likeness in color with amber he is named river Volga amber. Name Simbircite, Yellow Calcite was given V.M. Efimov in 1985 in honour the old name of city of Ulyanovsk is Simbirsk (Russia, CIS). Tendon Simbircite, Yellow Calcite - appeared in emptinesses of marlitic concretions by a hydrothermal mine deposit from stratal waters. Has a lamellar, kidney-shaped reniform picture. The thickness of vein, lode, mines arrives at to 10 sm sometimes Be found often. 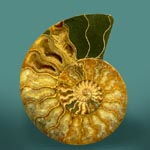 Ammonite Simbircite, Yellow Calcite - appeared in emptinesses of ancient shells of Cephalopodas of shellfishes - ammonites. Together with the mother of pearl and pyrite creates a surprising picture and colour gamut. Be found rarely. The locals of river Volga since olden times made out of this stone guard, amulets, pendants and other decorations. Simbircite, Yellow Calcite - warm sun stone. It gives the energy a people which carries him. Since olden times powder from him was used for cicatrization of wounds and treatment of eczemas. It gives the energy, and when touch to him, seems, take a little sun in hands. Wares from Simbircite ("river Volga amber") are characters of sufficiency, domestic prosperity and happiness, able to recover the peace of mind and equilibrium.